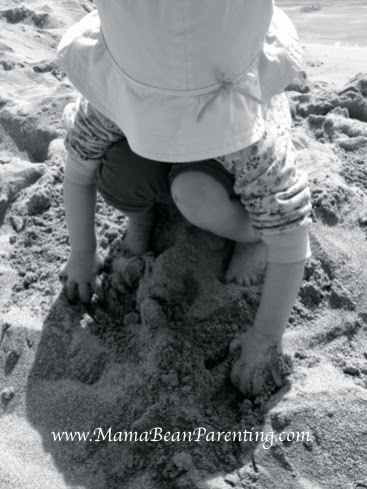 As I sit watching little bean fill up her bucket with sand, I realise that I’ve been waiting for some kind of perfect all my life, and that the most perfect kind of perfect is sitting right in front of me; with sand between her toes and a smile across her face. You see, I’ve always been an imperfect perfectionist; a less-than-ideal combination. I used to see perfectionism as a good thing; as one of those ‘fake problems’ to put against the ‘worst character trait' box of a job application. But since little bean arrived, I now see the hidden demons of perfectionism. I see these demons staring me in the face with worried eyes and a wobbling lip…I see them through my daughter’s eyes. Because for every high-bar I set for myself, little bean sets herself one too. And every time that I miss or fail, without grace and without acceptance, little bean sees only the pain and stagnancy of failure. She is blind to the lesson; the potential growth, the simple acceptance and resolve to move on with living. I didn’t meet every demand that was put upon me today, but I forgive myself anyway. I didn’t win the Perfect Wife and Mother Award today, but I forgive myself anyway. I didn’t act with grace at all moments today, but I forgive myself anyway. And through all of this soul-searching, I’ve found one clear thing. One gleaming light of realisation that couldn’t have come soon enough...While waiting for the perfect, I’m missing out on The Now. And in most moments of most days, there is some kind of perfect hidden in each and every Now. Not the neat and airbrushed kind of perfect that we think of by default, but the soft and real kind of perfect that’s covered in sand and beaming from ear to ear. It’s the smile beneath the dried-on pasta sauce. It’s puddles on a rainy day. ...It’s seeing stones as treasure. I used to think that perfect was orderly and clean; predictable and steady. Now I know that perfect is muddled and murky; unpredictable and erratic. Now I know that some kind of perfect lies happily within all of life’s imperfections. And the more that I accept it and breathe it in, the more likely it is that little bean will grow up accepting herself fully; for exactly who she is. And there’s a whole load of perfect in that. So true! Parenting is hard - physically and mentally - it's about finding the perfect in between laundry loads and dirty dishes. Thank you as ever I love your writing! Thank you :-) Oh how right you are...to be able to see past the laundry and dishes is nothing short of an art form! "It's seeing stones as treasure" - beautiful!!!!!!!!!!!!!!!!!!!!!!!!!!!!!! Thank you Zarina :-) It sure is...not easy, but kind of magical finding that balance!